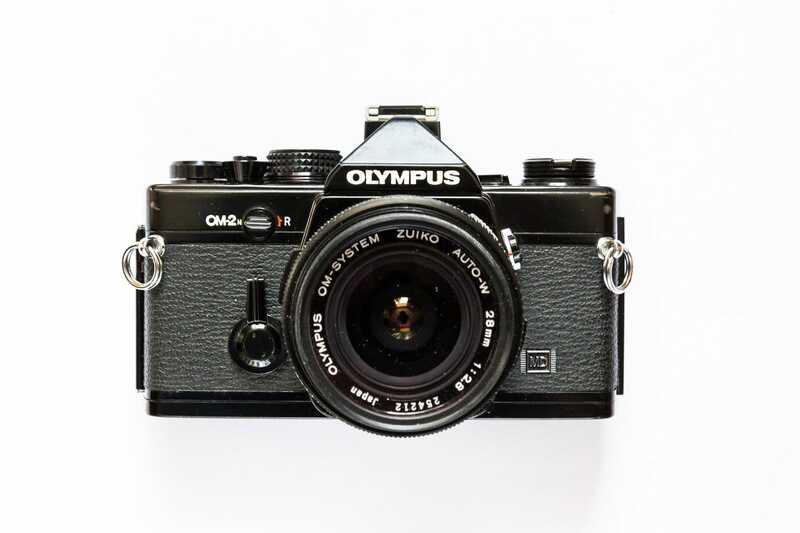 I effectively fell into my film street photography camera setup when my uncle very kindly donated me his old Olympus OM-2n MD SLR which had been sitting in his cellar. 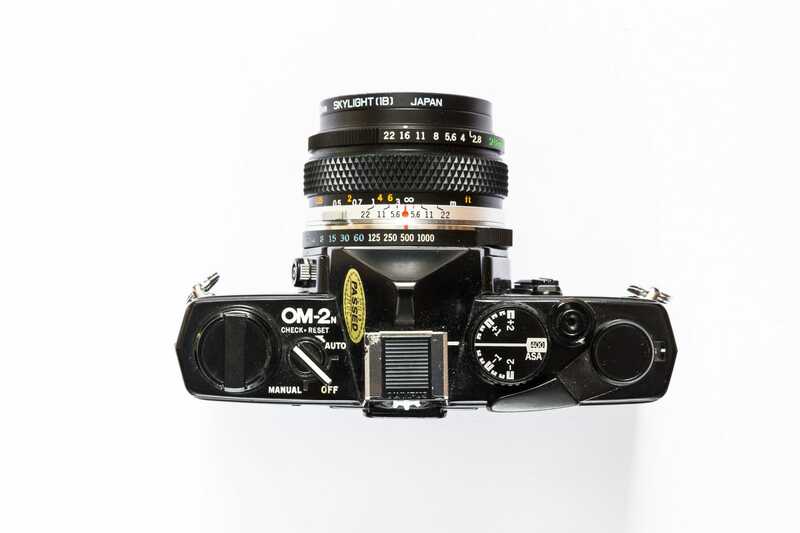 The OM-2n is a pretty highly regarded 35mm film SLR from the 1970s with manual controls and an automatic shutter priority mode, and (by all accounts) a fairly decent built-in TTL metering system. Helpfully I was already relatively familiar with the OM’s manual controls and viewfinder as my dad actually has the same camera and a set of lovely OM mount Zuiko lenses. I knew the SLR form factor would be ok for street photography from my experiences with my own Canon 6D DSLR. So I gave the Olympus a quick clean with some methylated spirit, bought a pair of new batteries on eBay, and invested a frankly eye-watering £15 to replace a missing little metal cover that hides the motor drive components- my OCD couldn’t stand to leave it exposed, and I didn’t quite have the heart to just use gaffer tape after I’d dragged the poor camera out of its retirement! With all this done, I was almost ready to rock. But first I needed a lens. I am currently of the opinion that a 28mm prime lens is the best lens for street photography, and, fortunately for me, my dad’s lens collection included a 28mm Zuiko f/2.8 so I was in business. 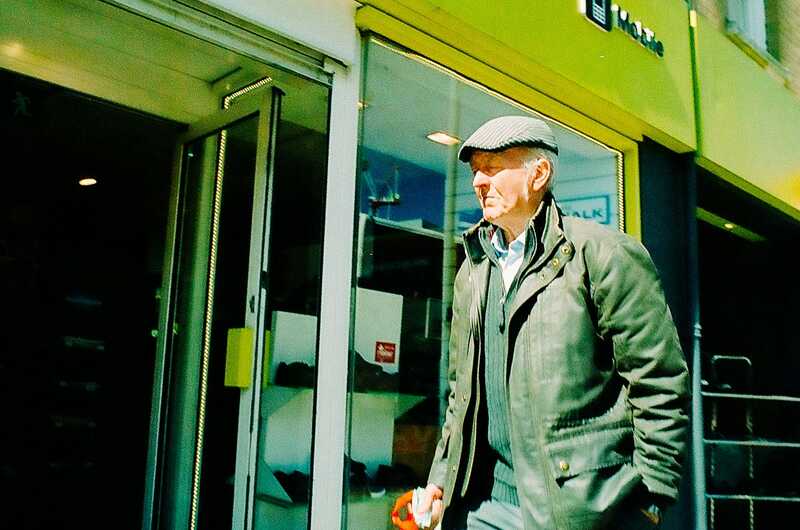 For my 35mm film stock I selected some Jessop’s (a large UK camera retailer) 400 ASA colour film that had been sitting in a cupboard and had long since expired (but more on that later), had my dad show me how to load into the Olympus, and I was away, and ready to hit the streets. Over the course of a couple of months I shot my way through a roll of 36 exposures. I got the film developed and the prints back the other day. So what did I learn? I’ll begin with something which directly affected my shooting experience (rather than just the results of my photos) and was one of the reasons why it took me so long to work through my 36 frames – being hamstrung by ISO. My favoured technique for shooting street photography is a full manual approach, where I prefocus my lens using the zone focusing and hyperfocal distance technique and set my camera exposure once, making only small adjustments on the fly. Normally with a digital camera like my X-Pro1 or X-T10 that will mean an ISO of 640-800 in sunlight, a shutter speed of 1/500, and an aperture in the range of f/8-16. In poorer light I’ll mostly crank the ISO up, rarely raising the aperture to anything larger than f/5.6 and only lowering the shutter speed or relying on autofocus in really bad light. This technique has (so far) stood me in pretty good stead with street photography, allowing me to work fast and instinctively, using the camera almost like a glorified compact point and shoot at times, and only worrying about catching a shot of an interesting subject. This was seriously challenged with film. All of a sudden I was resolutely stuck with an ISO of 400 whatever I did. Now, compared with what a lot of the old masters of street photography had to work with, an ISO of 400 is pretty high, so I should have been grateful really. But I wasn’t. Having shot so much on digital, I’m used to being able to crank my ISO all the way up to 6400 – a whopping 4 times as much light sensitivity as 400 – in order to continue to achieve a decent exposure. In the UK, in late winter and spring, this posed big problems. With my desired usual settings an ISO of 400 just didn’t really cut it a lot of the time even in sunlight. So I had to compromise. Not wanting to sacrifice the speed and flexibility afforded to me by zone focusing, I opened my aperture as much as I dared (mostly around f/5.6 or 8), and then lowered my shutter speed to 1/250 and even 1/125 at times. I naively hoped that I would probably be able to get away with shots without a combination of camera shake and motion blur if I played my cards right. I was wrong. I suppose my style has probably evolved (if that’s the right word) to be reliant on working quite quickly a lot of the time and a relatively high shutter speed has been overcompensating for this relatively poor technique. But film really showed me up. With a lower shutter speed the vast majority of my shots from the roll were junk and blurry. Most of the time this was because my subjects were moving, but on occasion it was because I was moving too. Having spent so much time recently shooting on an APS-C sensor sized mirrorless camera I’d forgotten to take into account the extra sensitivity of a larger ‘sensor’ frame to motion, and also the effect of the massive chunky mechanical mirror slap in the Olympus. Throw all these factors together and it’s no surprise a lot of my shots were destined for the scrapheap. My foray into film really emphasised to me just how much digital has conditioned my whole shooting style – not only do I consider ISO interchangeable with aperture and shutter speed as an element to be modified when setting exposure, but I actually favour it to an extent as it allows me to preserve my other settings. I can still remember when digital cameras first hit the mainstream and being in awe of the prospect of being able to see a photo as soon as I’d shot it. I still like to review my photos after I’ve shot them in my viewfinder, although it’s certainly very easy to miss shots, certainly if you’re ‘chimping’ using the rear LCD screen. No such problems present themselves with film. While it was a little frustrating not being able to see my shots, it wasn’t as huge an issue as I might have thought. That said though, the wait to see my shots was frustrating for several reasons – but more on that later. What did present a huge issue for me when I was shooting film, and ultimately undermined my final photos, was that I couldn’t check my focal distance. Despite carefully estimating my depth of field and setting my lens focal distance with the help of the DOF app I ended up with lots of shots where my subjects were just out of focus. Had I been able to quickly live view my image or review after shooting I would have avoided this issue. With hindsight, perhaps I was not such a dab hand with checking focus in the Olympus’ split prism viewfinder as I thought I was. This whole focus issue perhaps says more about me as a photographer than anything, but it’s still worth mentioning as part of my experience. The same can be said for the shutter speed issue I mentioned above. Had I caught the issue earlier (ie been able to check and review shots), I would have modified my shooting style to suit. 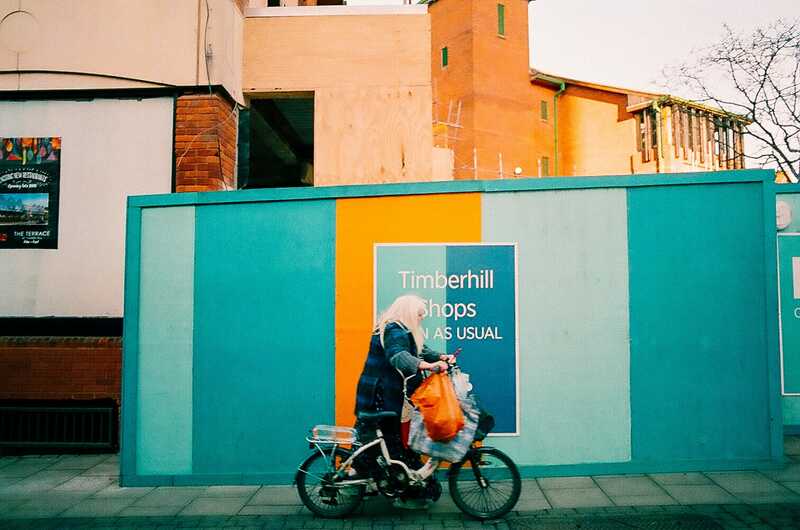 While the initial investment in analogue street photography is pretty low – you can probably pick up a decent manual film camera with lens for around £20-50, and get hold of 35mm colour film in the UK from places like Poundland – the ongoing running costs really mount up. Now film processing is no longer the consumer and industry standard development costs have skyrocketed. This is not so much of an issue if you are a monochrome black and white street photographer as you can process your negatives at home, but as a colour street photographer I was at the mercy of my local film processing lab. 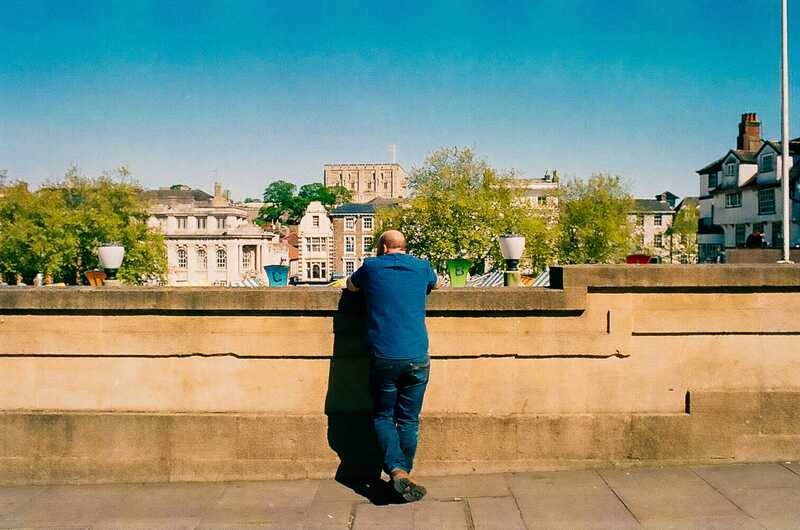 To give you an example of the cost, I shelled out over £10 to have a roll of 36 processed, printed and put on a CD at Jessop’s as I had only a couple of film processing options in my home city of Norwich. That’s pretty expensive considering the low hit rate of keepers I get with street photography – par for the course, I try to reassure myself, given both Matt Stuart and Alex Webb maintain that street photography is “99.9 per cent failure” (Webb). However, taking this approach with film, the costs quickly rack up, and digital looks more and more appealing. Even if I got my development and film costs down to £6 for 24 frames (the cheapest I can find at the moment), it would still get expensive quite fast. You can now get hold of pretty decent digital cameras quite cheaply, buy a couple of hard drives and a memory card, and keep on shooting and shooting and practicing and practicing. Initial investment with digital will be higher, but the costs are amortised much more effectively than film with its high running costs. Of course digital photography requires a computer for processing, but I’m willing to bet access to a computer, tablet or smartphone capable of downloading Jpegs is now much easier to find throughout the world than cost effective labs that process colour film! Running costs with film easily spiral. To be absolutely honest, I was really disheartened by the results I got when I had my film processed. Aside from the technical execution issues (the fault of which can be laid at my door) I was gutted to see that the colours in the final prints and scans were very washed out. I expected to have the occasional white balance issue – we have, after all, been spoiled by the auto white balance in digital cameras and also by Lightroom’s easy editing – but the colours certainly didn’t have the punch I was expecting. Now, this is probably down to the age and quality of my film more than anything else (it had certainly expired). Other possibilities are the lab having to push some of my underexposed frames in order to get an exposure, or even possibly the vagaries of the paper stock, but I will give everything the benefit of the doubt and blame my old film first and foremost! The fact remains however that I was expecting better results so it would be remiss of me not to talk about my disappointment, especially given that as a medium film requires us to patiently await our results and doesn’t give us the opportunity to review and revisit our results and even try again like digital does. This potential for crushing disappointment is an inherent issue for the film shooter I feel, and one that is simply not present to the same extent with digital. With a digital camera you know straightaway if you’re screwing up or not getting the outcome you wanted. With film you’re at the behest of luck, plus any technical issues with your equipment and specific film stock too. The director David Fincher (Fight Club, Se7en, Zodiac) puts it brilliantly when he talks about hating “the betrayal of dailies”, meaning that he could go a whole day filming thinking he had some great footage only to find that when the film was developed into the daily rushes it didn’t look how anyone had expected it to. The other big frustration with the wait to develop and ‘see’ my photos was how it affected my workflow. While there’s a lot to be said for allowing your photos to marinate, it was annoying not to be able to download photos in batches at the end of a day’s shooting, review, and then easily edit. Instead, with my roll of film I had a spread of photos from different days and they all sort of blurred together in my mind. While this element of mystery is nice to an extent, it was a little irritating not always being able to recall shooting a photo as I often find that a useful way to refine and improve my technique. Having to have my photos scanned digitally in order to be able to edit and share them (plus having to pay for the privilege) was a frustrating extra step in the process. Though I do concede that many people cherish instantly having a physical copy of their work. For me it only slowed things down as currently I catalogue my work digitally and only share my work online. Plus I had the new and unheard of frustration of having to deal with editing low-res 1500 pixel width Jpegs which was a big shock – whether the blame lies with me for not requesting higher res scans or Tiffs or if this is just standard practice I don’t know – you live and learn! The reality was that it certainly limited the amount of post-processing I could do myself. 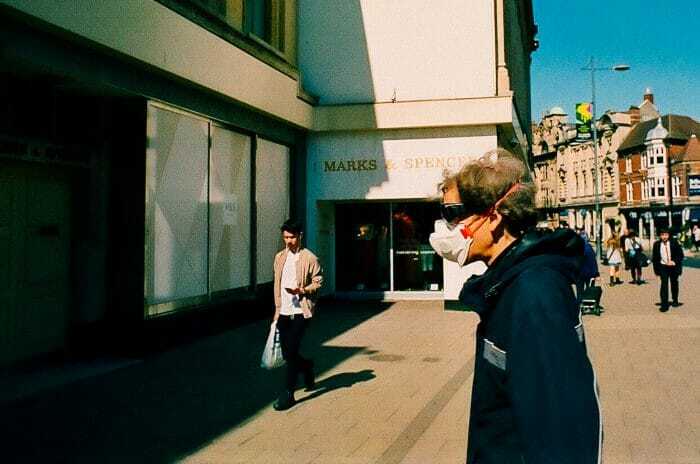 As you can probably tell, my film street photography experience was fairly negative, but a real positive I noticed during my time on the streets shooting with film was that the medium did slow me down. With hindsight, it didn’t quite slow me down and make me considered enough, but with each shot, I was, to borrow David Lynch’s (Twin Peaks, Eraserhead) words, conscious that it was “precious stuff running through there [the camera]”. This really made me realise that I needed to make each shot count (even if they didn’t in reality), and try to be much more measured in my outlook rather than ‘spraying and praying’ quite so much. I think this is a probably a good thing for my personal development. To expand upon this, one of the most important requirements of a good street photographer (and arguably a photographer in general) is not only to have a creative eye, but to be able to pre-visualise shots, and plan and estimate where you need to be in order to get the photo you want. It’s all very well being reactive, but you’re going to enjoy much more success if you can always think in advance and stay one step ahead of the game. Magnum photographer David Hurn recounts his first encounter with the Chilean photographer Sergio Larraín (also of Magnum), who told Hurn: “I think you might be a very good photographer – you can tell by the concentration people put into their pictures. Amateurs flit around: people who care concentrate.” Hurn goes on to expand that “there is an enormous difference between shooting in a much more considered way.” Film definitely forces you to do that, which is no bad thing! 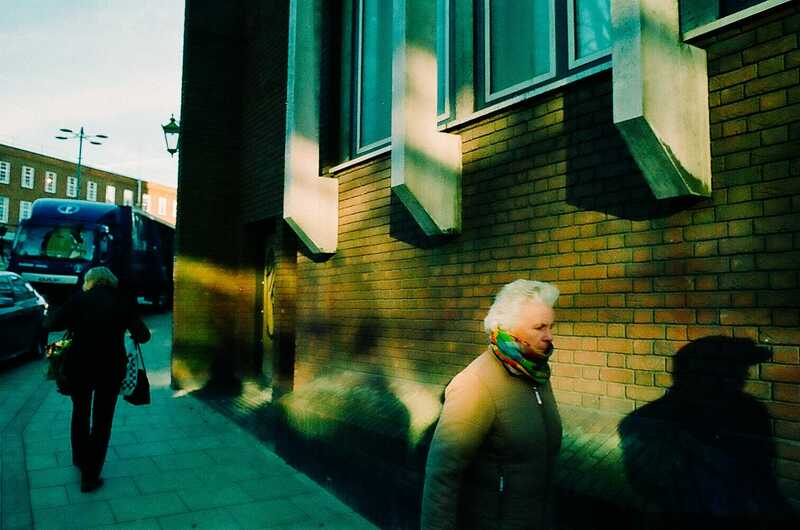 That said though, my results were hugely disappointing, and has given me a newfound respect for the master street photographers who shot film with far inferior technology to what I have available to me. I don’t plan on returning to film any time soon, but the lessons it taught me over just 36 frames were absolutely invaluable, and for that, if nothing else, I owe it a great debt of gratitude, and think all photographers owe it to themselves to give it a shot at least once. Digby, I think you did great for a first foray into film and I have felt your pain. My Dad gave me a cheap camera and slide film from an early age and on my 18th birthday presented me with a Canon T70 and FDn 50mm f1.8 lens, I remember it clearly as though it was yesterday. I used the T70 all through the 80’s and 90’s as a snapshot camera, never really understood how to use it, no EXIF so if I did have a good shot couldn’t remember what I did right. Finishing off a film to get those amazing shots processed that had been sitting in the camera for sometimes 6 months only to be dissappointed yet again! It’s only now through digital that I’ve learned a bit about controlling my camera and I still get blurred shots with moving objects. 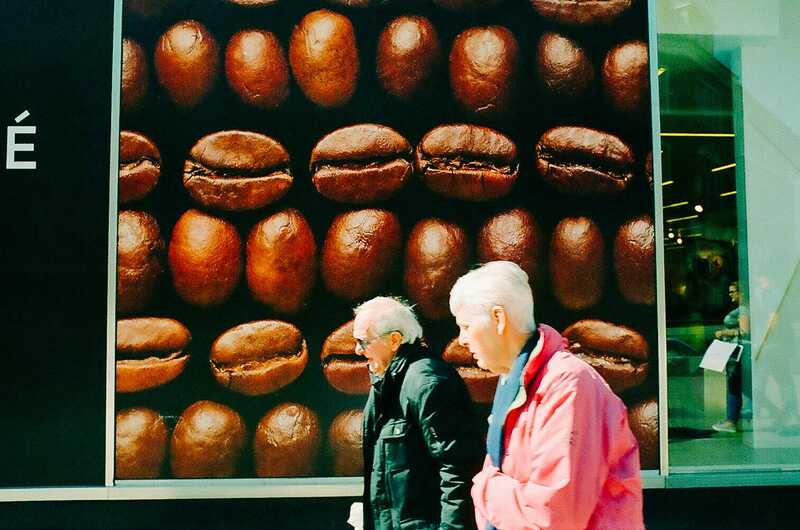 I just wish I’d discovered street photography when I was a student in 80’s Aberdeen or when working in Brussels in the 90’s I can only regret all the amazing images I have missed. Still it’s 2017 and time to make ammends, that T70 still works, LCD display (yes you read that correctly, LCD) is as bright as it was in 1984, so maybe I’ll run an Ilford HP4 through it this summer. Also now have an FDn 85mm f1.8 which I use for protraits on my Fuji X-T10. Thank you so much for your kind words Silver Machine! I agree film is much, much harder to learn on because you can’t keep track of settings as easily etc, or even learn the ins and outs of exposure as instantly (and that’s before we get to flash work too!). With digital you’re really spoiled by contrast! 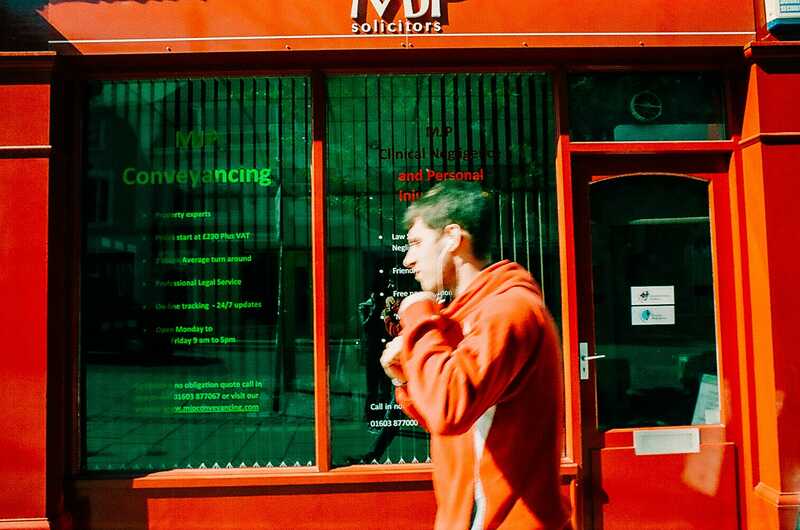 Keep enjoying your street photography with both film and digital! The trouble with the world today is that everything has been brought down to a this versus that situation. Film versus digital for instance. Having spent the first seventeen years of my working life in the film industry, I got used to handling film, loved to feel it running between my thumb and forefinger and yes loved the smell of nitrate and later safety film stock. When I took up photography it had to be film because there was no other choice. Now we have digital, which has come on in leaps and bounds over just a few decades, and I don’t regret using it. In fact it has given me the opportunity to experiment for free where film would have cost me a small fortune. Cost of film is the main reason it slows one down. I shudder when I think how many slides I put my thumb through over the years. I could have purchased a couple of cameras with the money wasted. 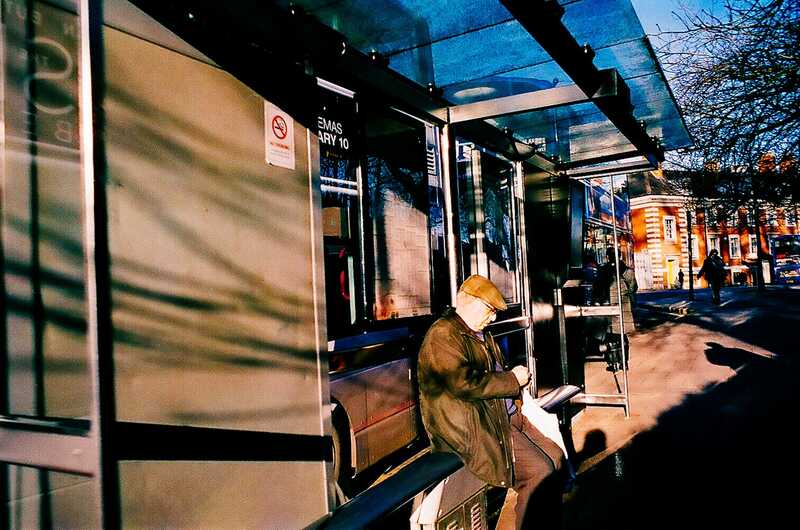 In 2000 I was paying around £3.50 for a roll of Fuji Velvia 50 slide film (I used to by 24 rolls at a time to keep down the cost and stored them in the fridge. Processing cost about £4 if my memory serves me well, so around 19 pence a shot. And a Cibachrome print from slide was mega expensive. Even so, there was, and still is, something magical about film, and especially mono. It’s the way silver halide crystal reacts to light, always creating individual patterns on the surface of the film. That’s where the magic is and why each print has a uniqueness that can never be replicated by digital pixels no matter how hard we try (and I do try, believe me). I don’t believe that one media should challenge another though, both have a legitimate place in the scheme of things. I now prefer to use digital, as a lot of people do, but film will always hold a place in my heart. And by the way, I still shoot in exactly the same way with digital as I did with film (habit I guess). A slow and measured pace. I work on the assumption that my next picture will always be my best. For me, there were no downsides to using film but with slide film, which has a dynamic range of around 3 stops, it is essential to get the exposure right first time. There were no second chances as there is today. And we should be grateful for that. Thanks for the measured comment Keith, lots of food for thought there. I guess we like to think of things in a this versus that way because we like to feel like we’re on the right track with things. Plus with how my brain works I’m not very capable at hopping between things – bit like Windows vs Mac or Watercolour vs Oils for me – I can only really handle one at once! But it’s important to always keep an open mind of course. I can’t get away from the cost thing either, and I’d say it’s getting more expensive too. I remember back in the early to mid 2000s getting a roll of 36 colour 35mm done at Jessops for about 4 or 5 quid with prints, and you got given a free roll too! Film sure is magical though, and particularly in a cinema context (though digital has got great too, and created so many new opportunities)! If you are happy, good for you! Cheers Sebastiano! It’s a good approach to take in life in general I think! My first “serious” approach to photography was with a digital D5100. With that camera I learned the basics. Half a year ago I started trying film with a Nikon FE, a 24mm f2.8AFD and a roll of Ilford Pan 400. The results were aceptables. I mean, no great pictures, but certainly no crushing disappointment. I mainly use the aperture priority, maybe thats why all of the pictures were perfectly exposed. The bad ones were a couple of very out of focus shots (I kept forgetting to focus before pressing the shutter), and some blurred subjects. That film was developed in a lab, which gave me the images on CD. Then I went to a C41 developing workshop. Till today I developed only 2 rolls, one on the workshop, and one by myself. Never developed ByW film, but, C41 is pretty easy to develope. I suppose is easier than ByW, since the brand of the film and the ISO does not matter, all the temperatures and times are always the same. Thanks for the comment Eco. Glad to your film photography experience is a positive one, and your C41 developing exploits sound good. Developing as a whole sounds pretty fun actually, at least you get to feel even more connected to your shots that way!